Louchard sticks her neck way out in this slight but pleasant volume whose design seems grander than its concept. Clean, uncluttered illustrations, fold-out flaps, and text that twists, turns, and bends to augment the drawings it describes are used to posit answers to the age-old conundrum, “How does a giraffe sleep? His neck is amazingly long.” While a definitive answer is never forthcoming, several scenarios of varying degrees of silliness follow. The anatomically incorrect giraffes are charming, with friendly faces and improbably long, skinny necks that could never support their skulls as they twist, turn, and stretch in many uncomfortable-looking directions. Caregivers will find themselves twisting and turning this board book in every direction as the text follows the giraffes’ long necks while they search for a comfortable position. The text is unrhymed and a bit uninspired, although readers in the target age group likely won’t complain. Though the prose never rises to hilarity, each scenario in which the giraffe finds himself—curled into a spiral, resting his neck in a tree, or wrapping his neck around a tree limb, for example—is summarily dismissed as laughable, with such statements as, “What a STRANGE idea! 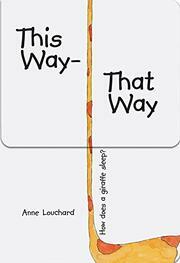 Have you ever seen anything so silly?” “No way!” and “That would be FUNNY!” While that may be the case, it might have been best to let young readers reach their own conclusions.